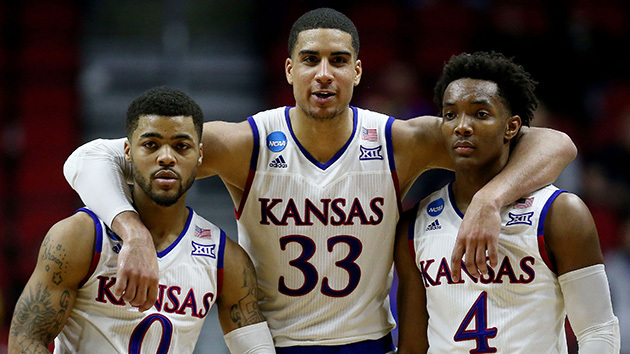 South region reset: Can Kansas get back to the Final Four? No. 1 Kansas, No. 2 Villanova, No. 3 Miami and No. 5 Maryland are still alive in the tournament's chalkiest region. Who will head to Houston from the South region? Of the four top seeds to have survived the NCAA tournament’s first weekend, only one is so bold as to have listed, on the schedule page of its official athletics website, the dates and times of both the Final Four on April 2 and the national championship game on April 4. Think the good folks in Lawrence are confident that the Jayhawks will still be playing next month? Well, it’s hard to blame them. Kansas entered the tournament as the No. 1 overall seed and nothing that happened in Des Moines during the first two rounds did anything to change that opinion. The Jayhawks smoked No. 16 Austin Peay by 26 points and No. 9 Connecticut by 12 and have yet to be challenged. Of course, they haven’t gone past the Sweet 16 in any of the past three years despite being seeded No. 1, No. 2 and No. 2 in that time. If Kansas does make it to Houston, it will have earned it, as the South features the second lowest combined seeding (11) of the four regions. (In the West, the top four seeds each advanced.) The Jayhawks have shot 49.6% this year, fifth-best in the nation, and were even better last weekend, making 52.9%. Now that Kentucky (Tyler Ulis and Jamal Murray) and Wichita State (Fred VanVleet and Ron Baker) have been sent home (the latter pair by the Hurricanes in Saturday’s second round), Miami can make a reasonable claim to having the best backcourt in the tournament. Seniors Angel Rodriguez and Sheldon McClellan combine to average 28.6 points per game, but they went for 44 points in the first-round win over Buffalo and 46 against the Shockers. Add in an athletic 7-footer in Tonye Jekiri (another senior) and Jim Larrañaga​’s team—which finished the year ranked No. 10 in the AP poll—appears to have the necessary pieces to get to Houston. In some ways, Trimble has failed to build on his outstanding freshman campaign. His scoring average has dropped from 16.2 to 14.5, and his rebounding, field-goal shooting and three-point shooting have also declined while his steal and turnover numbers remained flat. Still, few players are more electric when at their best than the Terrapins’ speedy 6'3" sophomore, and few can take over the game as completely as he can. With an abundance of talented teammates inside (Diamond Stone), outside (Rasheed Sulaimon) and on the wing (Jake Layman), Trimble will have ample opportunity to display the one area he made a noticeable improvement in: assists, a figure he boosted from 3.0 per game last year to 5.0 this year. And he scored 43 points in Maryland’s first two tourney games, matching his best back-to-back output all season. Now that they have broken through to return to the Sweet 16 for the first time since 2009, the question for the Wildcats is, can they make it back to the Final Four? Doing so will require consistent outside shooting from their top four outside marksmen: Ryan Arcidiacono (37.0% from three-point range), Josh Hart (35.9%), Kris Jenkins (37.0%) and Jalen Brunson (37.3%). In the team’s five losses, Villanova shot just 30.1% from outside on almost 29 attempts per game; in its wins, 36.1% on a little more than 24 attempts per game. Offensive balance and three-point accuracy will give the Wildcats an excellent shot at advancing. The Jayhawks are too balanced and disciplined for the mercurial Terrapins and too stout defensively to let McClellan and Rodriguez dictate play in the regional final. Miami will have to settle for reaching its first-ever Elite Eight. Kansas will get to celebrate reaching the Final Four for the first time since 2012.